All the ingredients for a successful fundraiser are just a click away when you start a Little Caesars® Pizza Kit fundraiser! Once you've started a fundraiser, you may log in to download these resources from your chairperson account. 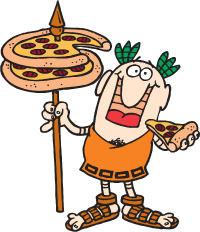 Little Caesars® Pizza Kits fundraising articles give you creative fundraiser ideas, fundraiser help and advice from our staff of experts, and yummy recipes. This might be your very first fundraiser, or maybe you're a fundraiser pro. Either way, we're here to help make each Little Caesars® Pizza Kit fundraiser FUN and easy to manage. You can find all of these in your chairperson account. Stay organized during your fundraiser and spread the word about your fundraising goals! Once you've registered your fundraiser, we'll send all the materials you need to run a successful sale, including brochures & posters! Your group will also be able to order online & pay by credit card, making the fundraiser even easier for you. Click here to get a preview of what's in your brochure. Pizza Kits, Bread Kits, and Cookie Dough exclusive from The Cookie Kitchen®!